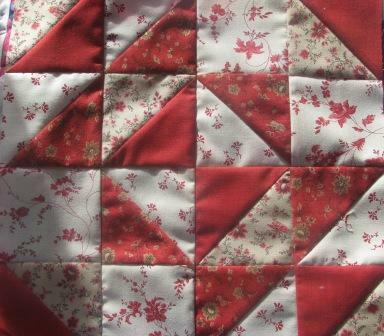 Here's Block 2 of the Moose on the Porch 2010 Quilt Along. 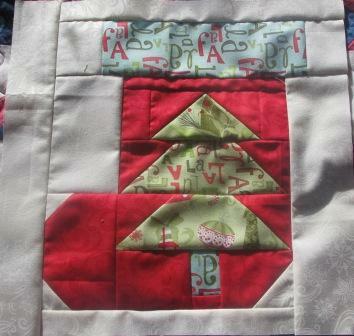 This block was designed by Vickie Eapen of http://www.spunsugarquilt.com/. 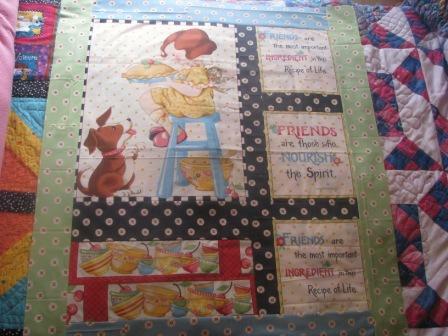 I really like this quilt along. The blocks are beautiful and the directions are really clear and easy to do. At first, I wasn't sure if I would have the time to get these blocks done, but so far so good. I also received and put together Block 6 of the FatQuarter Shop Mystery BOM. This block is named "Hung by the Fire" and was designed by Barbara Groves and Mary Jacobson. This BOM program is amazing! The blocks are pretty, easy and the directions clear. Also, they send you lots of fabric for each block (in case you make mistakes)... so I'll have lots of scraps to play with! 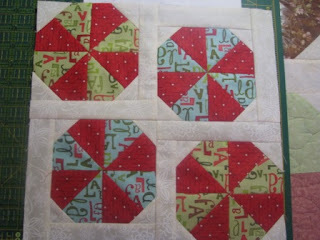 I also got to work on my new project this weekend... finished all the blocks and am now sewing them into rows. If all goes well, I may be able to post a picture of an "almost finished" quilt top when I get back from the cottage Sunday night. The new Fab Shop Hop is starting today... check it out here. I completed the first block of my very first Quilt Along this weekend. This is the Layer Cake Quilt Along sponsored by Moose on the Porch Quilts (see the button on the right of this blog). 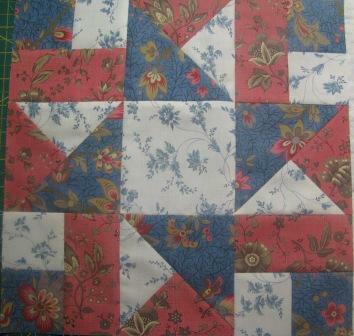 The block is called Alabama Spinner and was designed by Gene Black. I'm using Rural Jardin by French General for Moda. I also started on a new project - this one is for my sister-in-law's birthday in December. I'll post pictures when the top is finished. That's about all the quilting I got done this weekend - had to come back to the city early today because my beautiful little girl had indoor soccer this morning. So I’m creatively challenged… I’ve never been one to enjoy colouring outside the lines. 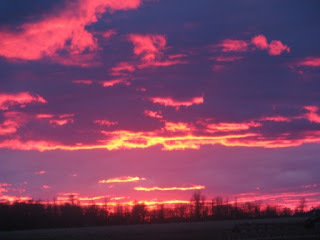 I always admired people who can paint beautiful landscapes, or sew clothes without a pattern or design quilts from scratch. I need a pattern… I need to be able to follow directions and the only step where my creativity is going to somewhat come out is in the choice of fabrics. I’m not crazy about it, but for a first attempt at “colouring outside the lines”, I’m thinking it’s not bad. Once it’s quilted and the binding is put on, I’ll probably hang it up in the kitchen at the cottage. Maybe I’ll even use some of the coordinating fat quarters to make place mats from scratch… with no pattern! And this one is what I woke up to Sunday morning!!! Can you believe it?! 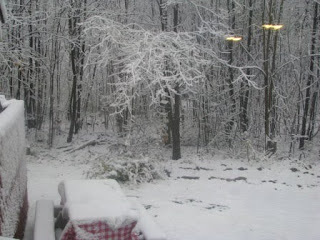 This picture was taken on October 31... not December 31!